I'm posting this for IF's topic this week, which is fierce. This woman has a fierce energy that will help her to break through tough obstacles. 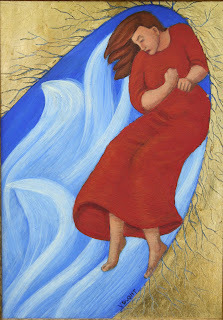 This is a very tiny painting; 7" x 5", egg tempera and gold leaf on panel. For me, it has the function of a cave painting in that I see it as granting me the power to work through difficult situations. When I look at this piece of artwork, what comes to my mind is Radical Feminism. In her face i see this emotion of "let me out" as she trys to get out of this bad situation that she is in. In some way it also reminds me of Marxist feminists as she is being oppressed by "the man" in this shell type of cave she is stuck in. She needs to find a way out and the only way to beat "The Man" is to escape. I would agree with what Nick said. By being cornered into this nook she has no option but to rebel and rise up against her oppression. She cannot turn her back or try to run or hide from society or "the man". She has a look of being trapped or held down by the world around her and is ready to fight back. This is another beautiful piece of art! It says, I am a fierce woman and feel my energy! Strange composition, this poor woman is oppressed. Up a creek is what I see. And the water is fierce about it! I want to take her out of there, glad there is a lot of light.